When Neil Magny got the news that the UFC had found him an opponent for this weekend’s fight card in Liverpool, England, twin waves of excitement washed over the welterweight contender. Originally scheduled to face Gunnar Nelson in Sunday’s co-main event, the Icelandic grappler was forced out of the matchup at the end of April, leaving Magny to dangle without a dance partner. As he sat awaiting news of a new opponent, his former wrestling coach Leister Bowling passed along a link to a story about a local girl battling a rare neuromuscular disorder. Moved by the story and eager to help, Magny took to Instagram, sharing a picture of Presley O’Doherty and the link to her GoFundMe page while pledging to contribute $15,000 in order to help ensure she gets the treatment she needs provided the UFC found him someone to fight at the Echo Arena on May 27. A few days later, the UFC announced it had inked Cage Warriors standout Craig White to fill-in for Nelson and share the cage with Magny, thereby providing him not only with an opportunity to step into the Octagon and do what he loves most, but also allowing him to make good on his pledge to help the O’Doherty family. “I started reading about this girl and her condition on her GoFundMe and I realized how much of a drastic situation her family are in,” said Magny, who has subsequently connected with Presley’s mother and is planning to spend time with them following his “work trip” to Liverpool. “That’s what really inspired me to dig deep and make a bigger contribution than anything I’ve every done in the past. “I’ve always contributed to things I’ve felt some kind of way about in the past – a charity or whatever – but it was always something comfortable for me, like, ‘Oh, I’ll give a hundred bucks.’ But I’m in a position where I’m able to help this person out and I should do it. It’s a noble, generous gesture by Magny, and while he had no previous relationship with the family or experience with spinal muscular atrophy, the rare neuromuscular disorder the young girl is battling, the 30-year-old Colorado native knows first-hand what it’s like to be sitting in a doctor’s office hearing news that takes the air out of your lungs. 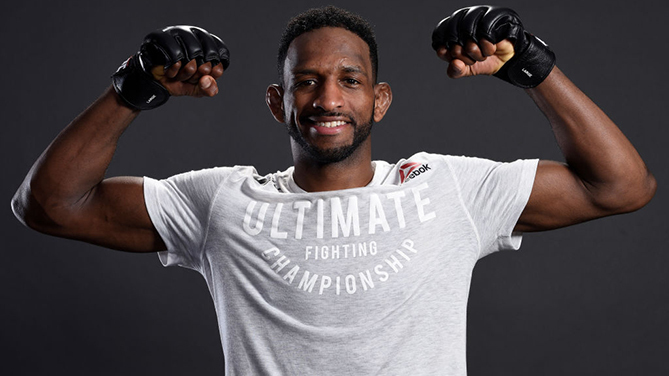 One of the most consistently active competitors on the UFC roster, Magny spent a large portion of last year on the sidelines dealing with a neck injury that had doctors telling him they weren’t sure he would be able to continue his career without undergoing spinal fusion surgery. Rather than going under the knife, he opted for physiotherapy and after 24 grueling weeks, he was finally given the green light to resume his career inside the UFC cage. “Last year at this exact time, I was sitting in a doctor’s office where my doctor is telling me, ‘Hey man, it’s not looking likely that you’ll fight and if you do, it won’t be without surgery,’” recalled Magny, who lost to Rafael Dos Anjos in September before rebounding with a unanimous decision win over Carlos Condit in December. He was also moved to act by the medical situation facing fellow UFC fighter Ray Borg and his wife, whose infant son Anthony was diagnosed with hydrocephalus, a condition where there is an accumulation of cerebrospinal fluid in the brain, and was rushed to Denver for emergency surgery and still remains in the hospital. As for the bout with White, the ever-positive Elevation Fight Team member sees his showdown with the short-notice newcomer as a fight that requires even more focus and an opportunity to step into the Octagon during a busy stretch for the welterweight division and make a statement. “(The fact that he’s a newcomer) doesn’t bother me at all,” he said of White, who arrives on a four-fight winning streak and brandishing stoppages in each of his 14 career victories. “At the end of the day, I know he’s going to come into this fight guns blazing. “He has a chance to gain everything that he wants and it’s right in front of him, so that’s a guy that I can’t take lightly. This is the kind of fight I can’t walk into thinking that I’ve already won it; it’s the kind of fight where I need to be on my toes, I need to be aggressive and go out there and claim what’s mine and not sit back and be passive about it. “At this point, it’s not about whom I fight anymore,” he added. “I’ve proven with the guys that I’ve fought in the past that I’m willing to fight anyone and I’ve done pretty well against those guys. At this point, it’s about how I fight. To learn more about Presley Mae O’Doherty, her condition and to donate click here. To learn more about Anthony Borg, his battle and to donate, click here.